End year holiday is associated with cold day and sizzling, satisfying meal. We crave for warm comfort food and eating together is a perfect moment to share good laugh with family, friends, and significant others. PizzaExpress saw this moment as a perfect time to launch their new menu. This is a classic appetizer with PizzaExpress’ twist. Funghi Zuppa di Pollo means Mushroom and Chicken Soup in Italy. The cream soup is made from cream, minced champignon mushroom, diced chicken, and special spices to give warming sensation in cold days. Crispy puff pastry also tops this soup. The twist of PizzaExpress is in the addition of whole shimeji mushroom to add more texture in the dish. Funghi Zuppa di Pollo is priced at IDR35,000. Le Rose will be the new addition in the list of PizzaExpress’ Romana pizza. 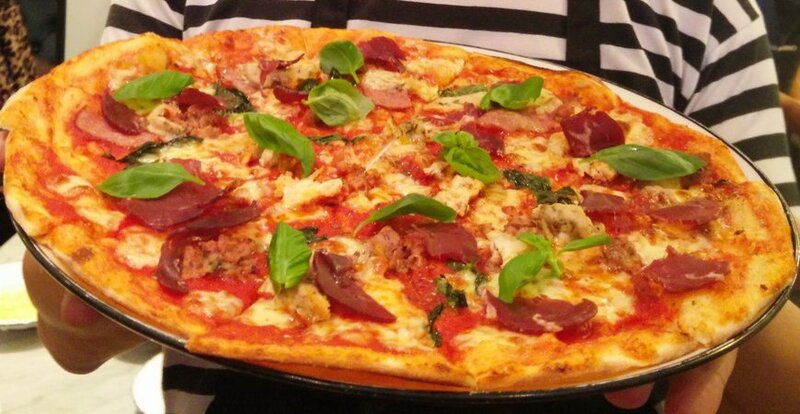 Made with tangy tomato sauce base and mozzarella cheese, four kinds of meats – beef bacon, crumbled sausage, chicken, and bresaola – complete the pizza with their salty and savory taste. Basil leaf is added to the pizza before and after it is baked. “Le Rose name came from red bresaola we use in this pizza. We formed the bresaola like rose petals and spread it on the pizza. Bresaola is a brined and dried beef from Italia and very expensive there. However, we have our own supplier of local bresaola in Indonesia,” said Endang. This pizza is priced at Rp110,000. PizzaExpress Seafood Lasagna is creamy and soft as it uses béchamel as base sauce. However, the combination of seafood and vegetables balance the thickness of the sauce. It is made with smoked salmon, shrimps, asparagus, and imported spinach. The last ingredient is chose because it is sweeter and bigger in size, made it more tastier and still hold the texture when cooked. Grana Padano cheese and dill leaves also top the lasagna. This menu is priced at Rp90,000. This holiday dessert is profiteroles with chocolate hazelnut filling. It is coated with crunchy and very sweet croquant caramel. To balance the sweetness, this dessert is completed with double cream dipping. Croquant Caramel Profiteroles is priced at Rp60,000. PizzaExpress also launched fruit-based beverage for its holiday campaign. They are refreshing and colourful as Christmas is associated with bright red and green colour. The first drink is Sparkling Strawberry Limeade made from strawberry syrup, soda, and lime. This beverage is priced at Rp40,000. The second drink is Green Apple Blackcurrant consists of blackcurrant drink and finely diced green apple. Like the first drink, it is priced at Rp40,000. Beside the new menu, PizzaExpress launched celebration package for those who want to organize an event. Celebration Packages PizzaExpress started from Rp3,000,000 for 30 pax to Rp9,500,000 for 100 pax. This package includes full set menu from Starter, Salad, Pizza, Pasta, Assorted Dessert, and Drinks. Using the power of social media, PizzaExpress also invites customers to share their moments in PizzaExpress. 5 chosen photographs that tags @pizzaexpressidn account and hashtag #PEidnMerryMoment in instagram will get special gift from PizzaExpress, 5 PizzaExpress vouchers worth IDR200,000.